It did not take long for the other shoe to drop. The six official leaders of the Democratic House have condemned Rep. Ilhan Omar of Minnesota for “anti-Semitism” and “hatred” because she tweeted last night that the Israel lobby group AIPAC has influence over the Congress “because of the Benjamins” — the money AIPAC helps funnel to Congress to support Israel. 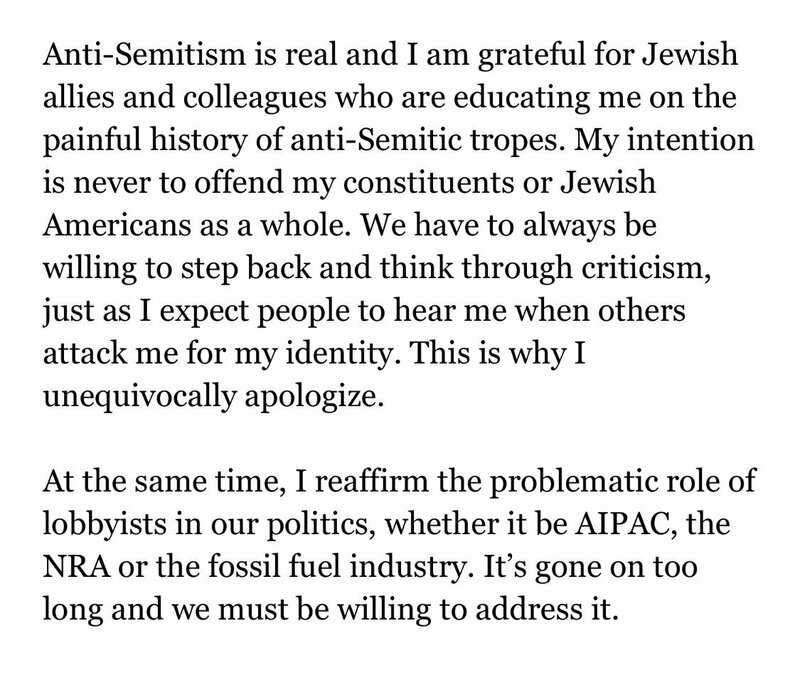 Congresswoman Omar’s use of anti-Semitic tropes and prejudicial accusations about Israel’s supporters is deeply offensive. We condemn these remarks and we call upon Congresswoman Omar to immediately apologize for these hurtful comments. In our conversation today, Congresswoman Omar and I agreed that we must use this moment to move forward as we reject anti-Semitism in all forms. The Democratic leaders are surely terrified that the Democratic Party is going to split over Israel and that it will endanger the party’s consensus and also alienate many of its biggest donors. Almost all the six leaders who signed the statement (below) have spoken at American Israel Public Affairs Committee — AIPAC– events or been adoring of the Israeli government. Here is Majority Leader Steny Hoyer appearing at AIPAC. Majority Whip James Clyburn has taken four trips to Israel. At least one of his staff has taken an AIPAC-sponsored trip– from the AIPAC wing the American Israel Educational Foundation. H/t Abushalom, Allison Deger, James North and Dave Reed. All contend is copyright by the directly related news source. MASSIVE.News does not guarrantee the accouracy of any of the external content feeds.